So I had all these grand plans for making a veggie meatloaf (neatloaf?) tonight, serving it up with a side of mashed taters & greens, but, well, that didn’t happen. Why didn’t that happen? Because G & I had to powwow and book our flights to New Orleans! Yup! We’re Nola bound before Christmas (and then we’ll be hopping over to Mobile to spend the actual holiday with my mom and her husband). Oh my goodness, I can’t wait, so much good good good food awaits (oh, and booze, my gosh, I can’t forget the booze!)! Suggestions, of course, would be awesome. I haven’t been to Nola in years, since before Katrina, so it’ll be interesting to see if it’s different or really the same. This means, then, no meatloaf recipe for you. It’ll have to wait till next week since I’m going to the Virginia Tech vs. Georgia Tech football game tomorrow (vegan tailgating?) evening and then have a friend’s birthday dinner at Tazaa, an Indian restaurant here. But, never fear, I’m making that meatloaf. I’ve been saying I will for over a year now, so really, it’s got to happen. What I do have for you, however, is stunning: Roasted Garlic & Butternut Squash Tomato Soup. Creamy with hints of roasted garlic, this is 1000x better than Campbell’s Soup, which is funny since that’s the profile I was originally going for. Did I mention that it’s easy too? I can’t stop eating this soup–it goes great with cheeze sandwiches, toasty bread, salads, just by itself–it goes great in a super cute thrifted mug like I found the other week too. Soup and Crackers, Crackers and Soup! With cold weather here for many of us in the northern hemisphere, this is really the soup to make–it’ll warm your tummy and your nose, it’s that magical! Chop the top of the head of garlic so that you can see the tops of the cloves. Place it in a piece of tin foil, pull the sides of the foil up to make a bundle. Drizzle in enough olive oil to cover garlic. Twist foil top to seal and place in oven. Bake for 30-40 minutes, until the cloves appear to be golden brown and soft. If you need to roast the butternut to puree, peel the squash, chop in half length-wise, and scoop out the seeds. Drizzle the scooped out side with olive oil and place on a baking tray in oven. Bake for 30-40 minutes until soft when poked with a fork. Once everything is roasted, place the diced tomatoes, tomato paste, and onion in a food processor. Squeeze/fish out the roasted garlic cloves and add to the food processor along with the butternut squash or butternut squash puree. Blend at high speed until everything is pureed. Pour the puree into a stockpot on the stove. Add vegetable broth. Bring to a boil, then lower to a simmer and cook for 20 minutes. Just before serving, add the can on coconut milk, stir to combine. Serve with your favorite soup accompaniment! Wow, this looks really good! I’m sure I’ll have leftover butternut squash hanging around later this month, I’ll give this soup a go. I think it would be really good with a sprinkling of roasted pepitas. mmm that soup sounds perfect! New Orleans will be so much fun! We are going to Oklahoma city for New Years which is on track to becoming the hot winter destination! Mmm, I bet the coconut milk makes this soup extra good. This sounds so good! Everything I love, in a soup! And woot for Nola for Christmas! Jealous I am! hooooray for Nola! you should talk to kittee – i bet she knows all the awesome places with the yummiest vegan Nola eats! i can’t believe i never thought of putting tomatoes in a butternut squash soup. brilliant, Jes – and so it lots ‘n lots o’ roasted garlic! so yum! i love your mug, and i hope you get to make veggie meatloaf soon, too (dan and i call it meatless loaf) – i’d love to read about your version! meatless loaf = comfort food, fo ‘sho – and great leftovers for sammies as well. w00t! This DOES sound so creamy and DREAMY! Yum!! I think of all my favorite soups (which is just about any soup), tomato is my VERY favorite, but I wouldn’t have thought of butternut squash and coconut milk. I’m definitely trying it. And have fun in NOLA! I haven’t been since before Katrina either. This soup sounds amazing, especially for us indecisive folk! I am absolutely going to have to try this immediately… I am actually pretty sure I have all of the ingredients on hand at the moment! I can’t decide what rocks more: that recipe or your soup mug! I just had a beetloaf so I’ll gladly take a bowl of soup instead! I love butternut squash, so this sounds amazing! Especially with the coconut milk. Served with a perfect grilled cheese I hope? Oh wait…Vegan…a peanut butter and jelly then! Mmm, that soup sounds great. I love garlic! That soup does sound great! I, for one, am also intrigued at the thought of vegan tailgating–definitely let us know what you make! garlic, tomatoes and winter squash seem to pair SO well together. This sounds so wonderful- Creamy and comforting… And very garlicky! Way to go for the gusto with a whole head! holy wowzers. that soup sounds so incredible. perfect for a cold and rainy night like tonight. I wish I had some right now!!! I thought I would add my comment- We LOVE this soup! I’ve made it several times and it is sooooooo delicious! 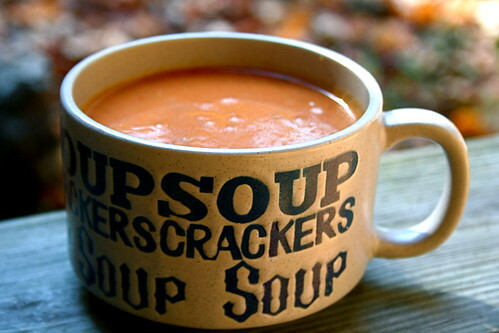 It’s like cream of tomato soup but so much better. Thanks for the recipe! Oh, and it’s actually not that garlicky- roasting the garlic changes how garlicky the soup is, I’m sure it would be very garlicky if you didn’t roast it first.